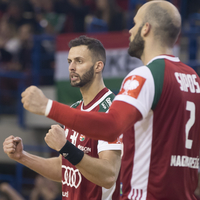 While Czech Republic took revenge against Belarus and Turkey earned their second victory versus Greece, the biggest thriller so far in round 4 of the EHF EURO 2020 Qualifiers played out in Erd, Hungary. The hosts turned an 18:23 deficit into a 23:23 draw, but missed their chance to book an early EURO ticket. Four days after winning the first leg in Greece 26:22, Turkey led for the entire 60 minutes on home ground. Thanks to a strong start (5:1 and 9:5), the hosts built the base for their second straight victory in this qualification phase, which saw them move ahead of Greece (still on two points) on the table. Greece had the chance to turn the match around only once, right after the break, but when the visitors reduced the gap to 13:15, the home side took full control again. The outcome was decided at 25:21 three minutes before the end. The Czechs are back on the top of table: After head coaches Jan Filip and Daniel Kubes’ team lost their home match against Belarus on Wednesday 30:31, they struck back in Minsk. With six points, the sixth ranked team at the EHF EURO 2018 in Croatia are on course for the final tournament in 2020, as they sit two points ahead of Belarus. Thanks to outstanding defence, the visitors were ahead 10:7 in minute 22 and kept the advantage until the strongest Belarusian period at the start of the second half. Five times, the hosts were ahead by one goal, but after 21:22, the Czechs kept the lead. Hungary missed a chance at early qualification for the EHF EURO 2020. To clinch their berth they needed a victory, but the home team nevertheless showed great fighting spirit and pulled off a sensational comeback. Three days after the 25:19 away win in Russia, the tides had turned completely: Russia were the clearly dominant team and seemed on the way to a win 11 minutes before the end, when they were ahead 23:18. But nobody could guess that this strike would be the last Russian goal in a true thriller. The fans in Erd watched their team stop Russia’s attacks and score goal by goal. Finally, after the last timeout for Russia coach Eduard Koksharov, Mate Lekai caused a turnover and scored the buzzer-beating equaliser. Hungary remain on top of the table with seven points, two ahead of the Russians – and both are on course for the final tournament.